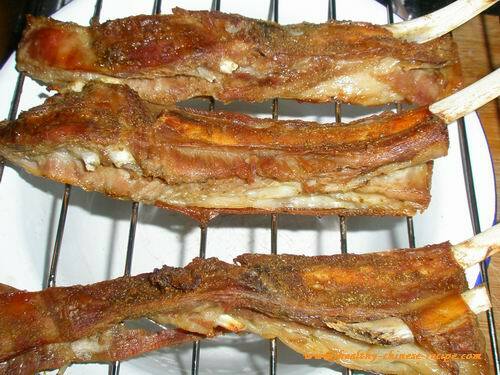 This Roast Lamb Rack recipe is a Chinese cuisine, very healthy. Boil lamb rib till cooked, then bake or roast 5 minutes. The flavor is already in the meat during boiling. So it's tasty and tender inside while crispy outside layer. The benefit of this cooking method is that you won't eat so much fat. There are much fat on the rack of lamb. After long time boiling, the fat will be left in the soup. Take away the fat after cool. You can drink lamb soup or use it to cook other dishes. Preparation and cooking time: 90-120 minutes. 1. Wash lamb rack. Put in a pot, fill cold water covering meat. Bring to a boil. Throw away water. Clean lamb rack. Refill 5 cups of warm water. Bring to a boil. Simmer 90 to 120 minutes, or till cooked. 3. Add Sauce B. Boiling additional 5 minutes. 4. Take out the rack of lamb. Drain well. Cut between bones. Now it becomes several lamb rib chops. 5. Rub cumin powder and chili powder. Arrange on a tray or grill. Roast 5 minutes at 190C(370F). 6. Take out, rub more cumin if you like strong flavor. Serve. 1. No oil added in this recipe. However, you can rub some when roasting if you like to. 2. Don't roast too long time. It's easy to be burned. It's already cooked. Function: Remove coldness. Those who feel cold can eat in winter.